Home » How Does The UK Labour Market Compare To The Rest of the World? It goes without saying that structural changes are having a significant impact on the UK labour market. Against a backdrop of tepid economic growth and ongoing uncertainty, employment has continued to stand at record high levels, while unemployment remains low. This is creating a tight labour market, with immense competition for talent. As the UK prepares to take a new position on the world’s stage, there has been much speculation on how the country will fare in a post-Brexit state, particularly where the workforce is concerned. Yet, before we can predict what will happen in the years ahead, we need to understand how our labour market compares to the rest of the world today. That’s where the Total Workforce Index can help. Based on a global analysis of more than 90 data points, the Total Workforce Index evaluates workforce availability, cost efficiency, regulations and productivity of permanent and contingent workers across 75 countries. The result is a comprehensive report ranking countries where skills, productivity and labour laws make it most favourable to do business. Let’s review how the UK labour market compares to the rest of the world. Availability of talent is an essential consideration when deciding where to locate a workforce. After all, if a certain geography cannot provide the volume of workers that you require, it’s not always the right choice – regardless of the cost efficiency, regulations and productivity they can offer. The UK scores highly in terms of workforce availability. Globally, it ranks 3rd out of 75 countries – beaten only by Ireland and Norway. Workforce size isn’t the only thing we have considered here. Language skills, opportunities for educational advancement, and migration policies can influence how favourably an organisation would view talent availability in any given country. As a result, the countries that score positively for workforce availability don’t necessarily have the largest or most mature market. Some orgainsations don’t need specialised skills or high levels of English proficiency. When this is the case, they can focus on the cost of skills instead. The UK isn’t the most cost effective place for talent – it ranks at 45th out of 75 countries. 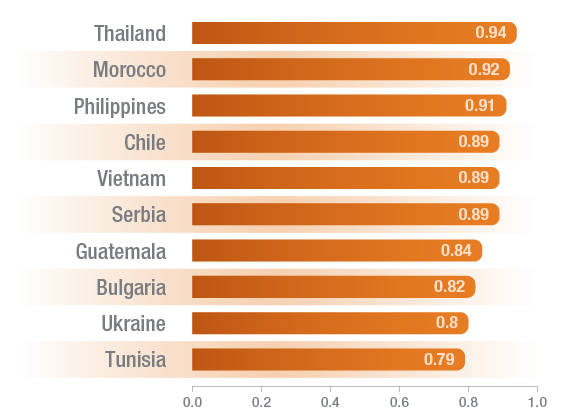 The top five markets for total workforce cost efficiency are Thailand, Morocco, the Philippines, Chile and Vietnam. It doesn’t come as much of a surprise that the UK is a long way down the list of most cost efficient markets. After all, traditionally, the lowest cost markets also tend to be some of the least mature. They may rank favourably on cost, but the majority don’t fare so well when ranked for availability, productivity or regulatory impact. The only exception to this rule on our ranking is the Philippines. They have made additional workforce investments that have allowed it to emerge as a global leader. Most new investments in the Philippines continue to be driven by the market’s cost efficiency, but the availability of skills and growing English proficiency is proving attractive too. The regulatory framework of a labour market is potentially the most influential factor that organisations consider when choosing where to locate their workforce. This is because of the knock-on effect that it can have on cost, skills availability and productivity. The UK is ranked in 7th place for total workforce regulation. It is new to the top 10 this year, after ranking at 24th last year. Looking at the top 10 countries for total workforce regulation, it’s Australia, Denmark, Ireland, New Zealand and Singapore who perhaps have the most interesting story to tell. These countries all rank in the top 10 for both regulation and workforce availability. 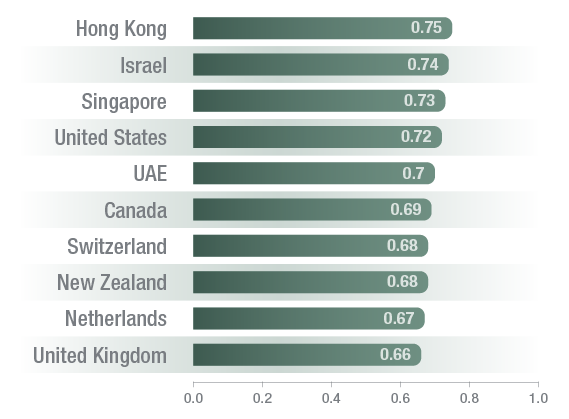 What’s more, New Zealand and Singapore rank in the top 10 markets for productivity, as well. While these aren’t necessarily the largest economies in the world, it’s clear that these countries could prove to be an attractive destination for organisations to invest in their workforce. Organisations need to strike a delicate balance between workforce productivity and cost. After all, countries that have lower wages may actually prove to be more expensive, due to worktime costs and the length of their working day. Countries that have longer working days have an increased chance of higher productivity levels, without incurring the added cost of overtime premiums. However, we didn’t choose to rank countries based on this alone. We also considered which countries have higher levels of infrastructural and technological efficiency, alongside a multitude of other favours. The United Kingdom ranks as the 10th market for total workforce productivity. It’s ranked quite consistently over the years, having placed 9th in 2017 and 17th in 2016. Singapore is perhaps the most noteworthy country in this ranking though, having seen labour productivity growth rise to potentially it’s highest level in seven years. This growth has been seen mainly in externally-oriented sectors such as manufacturing, wholesale trade, finance and insurance. How Does The UK Rank Overall? When we bring all four of these factors together – workforce availability, cost efficiency, productivity and regulations – the UK ranks as the 5th strongest country in the world for workforce engagement. The UK has remained consistent in performance over the last five years, having ranked in 7th place in 2017 and 9th place in 2016. The stability of our labour market, high English proficiency, flexible regulations and the availability of higher education make the UK workforce appealing to regional and global employers alike. Nonetheless, workforce engagement priorities differ widely between organisations, and business priorities have a substantial impact on the development of workforce strategies. That’s why the Total Workforce Index can also be fully customised as part of a consultative engagement, to align with your organisation’s specific priorities and needs. While the Total Workforce Index™ rankings are standardized for this report, fully customisable reporting based on the Total Workforce Index™ can be created in a consultative engagement to determine the markets that best meet organisational priorities. Find out how we can help with your workforce strategy, including how to get a customised index for your organisation, by downloading the full Total Workforce Index report.